Oolong - is semi-fermented tea, which incorporates the best properties of green and red tea and used in Chinese tea ceremony. 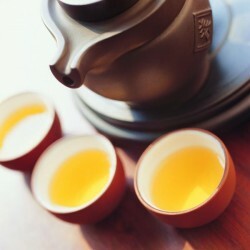 Oolong is grown in the provinces of Anxi, Fujian, Guangdong and the island of Taiwan. The word "in-moons" means "black dragon" that metaphorically reflects the volatile essence of this type of tea.